Add, Capitalize, Find and Replace, Modify, Rename and Clear Outlook standard and user defined fields. The Ultimate Outlook Contact Fields management tool. DTM ODBC Manager is a simple and easy-to-use ODBC Data Sources manager. The program allows you to export data source definitions into a file and then restore it on a local or remote system. The program works both with system DSNs and with user DSNs. Transfer data from any data source to another. Use our custom designed templates to increase speed for any Database platforms. Includes our most innovative and valuable feature which would be our scheduling tool. C# VB.Net SQL template driven Code Generator from a Database Data Model with Reverse Engineering to SQL Scripts. Execute, Test groups of SQL Scripts and produce SQL Patch Scripts. Concatenate file groups hierarchically with Placeholder substitution. PDAT Classic/SE (CLSE) is an ESRI ArcMap™ Extension that provides the means to load PODS centerline and event Data from from a PODS Data Model to a ESRI route Shapefiles™ or Personal Geodatabase™ and into an enterprise ESRI ArcSDE™ database. Manage the spatial component of the Data stored in PODS. The Database, Mailing and Data Withdrawal Manager will become a perfect assistant to your business. VSceneGIS Desktop. (GIS) Analysis, Computing and Editing. Customer Project Development, Analysis, Computing and GIS editing. VSceneGIS Desktop applies the concept of Tree and Graph Topology to implement the data model in a GIS. The TOOLBUS Interface for Enterprise Architect and CA ERwin enables the bi-directional conversion of UML Class Models and Data Models from Sparx Enterprise Architect to Logical Data Models and Physical Data Models respectively for CA ERwin Data Modeler (and vice versa). This cutting edge technology is ideally suited for database professionals and software enginneers alike to design any size data model or data warehouse. Database manager where you don't have to create tables, fields, indices or foreign keys. These are created and maintained automatically as you enter new information. You can go backward and forward in time to remember the information days ago. DeepForm is a graphic editor to design your XML documents. Designing the structure of your XML documents is easy and intuitive: DeepForm allows you to create, group and sort your XML fields into tables and sections with just a few mouse clicks. 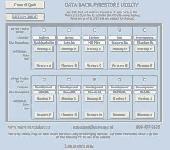 MS Access Data Backup Interface provides a means to easily backup files or folders. The VW Data Recorder is a recording readout for pluck-type vibrating wire sensors, RTDs, and thermistors. The VW Data Recorder is a recording readout for pluck-type vibrating wire sensors, RTDs, and thermistors. Simple to operate, the Recorder stores up to 2000 readings and can transfer them to a PC for processing with a spreadsheet. This software is designed to open, filter and print data download files from the Advance Welding ACT series electrofusion units. This software is designed to open, filter and print Data download files from the Advance Welding ACT series electrofusion units. It will recognise csv format files with the .xls extension and protected format files with the .pfd extension. Databook is a cloud ready data web browser designed to enable data stakeholders to take ownership of the data and to spread the power over data throughout the organisation. DeKlarit is the only Model Driven tool that combines agile database modeling, declarative business rules, automatic code generation and seamless integration with Microsoft Visual Studio.